Facebook has always been disliked for not having a dislike button. And there is no doubt that each one of us have felt this! Recently Facebook unveiled a new Facebook dislike sticker, but anyways the sticker can only be used in Facebook Messenger and it can no-way help you in expressing your views on the news-feed posts! 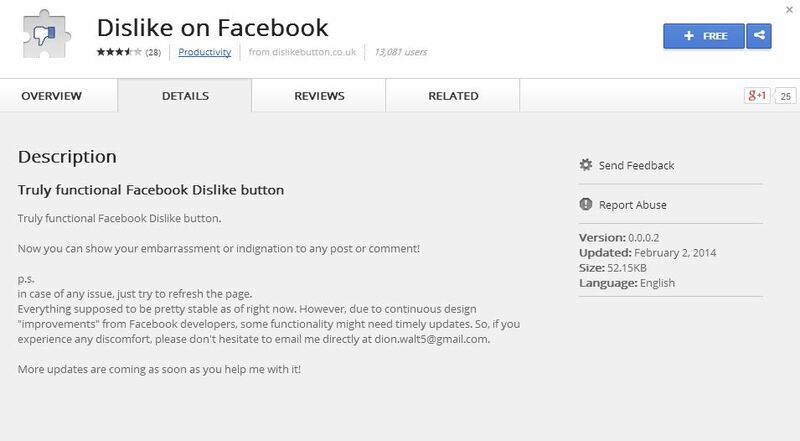 So here we have a Chrome Extension that would help you dislike posts by introducing a new dislike button, just near to your like button. Just go to the Google Webstore and find dislike on Facebook. Or click this link. And it just works like magic, and you will instantly get a dislike button on every posts. But, there is a little downside in this extension. One could find the details of dislike only when he/she has installed the extension. For example, the owner of the post should have dislike extension installed to view the dislikes for his/her post, which is like not having dislike button at all.